The familiar and encouraging words of our Lord in St. Matthew’s Gospel…”For I was hungry and you gave me food, I was thirsty and you gave me drink, a stranger and you welcomed me, naked and you clothed me, ill and you cared for me, in prison and you visited me.” (Mt 25: 35-36) are at the heart of what we do as Vincentians. With the generous support of our parishioners here at Annunciation Catholic Church and that of other community partners, we are able to help many who need material and spiritual support in our community. These needs continue to increase as we see a decrease in the role of government and continuing economic hardship for many. We are truly grateful for your contributions time and treasure. OUR CONFERENCE – We are part of a national and international organization of volunteers which served more than 14 million people worldwide in 142 countries last year. Our membership consists of 35 active, 52 associate, and 282 contributing members here at Annunciation. 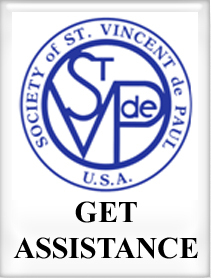 OUR MISSION – Inspired by Gospel values, the Society of St. Vincent de Paul, a Catholic lay organization, leads women and men to join together to grow spiritually by offering person-to-person service to those who are needy and suffering, in the tradition of its founder, Blessed Frederic Ozanam and patron, St. Vincent de Paul. CHARITY AND JUSTICE – The Vincentian calling is to serve the needy and advocate for justice. As in Jesus, fully embodying the love of God and bringing justice to the poor are inseparable realities. Micro Loan Program – opportunity to secure a small bank loan to pay for a vehicle repair/replacement, medical expenses, home repair, predatory payday loan, etc. ; client receives financial guidance, improved credit rating while repaying on a borrower-friendly loan provided by Fairwinds. Tech Support for Seniors – help the residents of Horizon Bay assisted living facility connect electronically with family through emails, Skype and other means possible; we hope to help those who want to reach out to family members through computer technology achieve that goal through loving, patient support. Pathways to Care – providing a hot homemade breakfast for residents of several Saturdays a month. Operates 3 Thrift Stores: provides free items to those in need such as clothing, furniture, etc ($80,000 of free merchandise given away last year); offers a place to find quality items for a reasonable price giving dignity to purchasing for yourself. If you would like your donation picked up, please call SVDP through the toll free hot line number 1-888- 986-4483. Cars are donated to someone in need locally or sold and the proceeds donated to the conference designated to benefit those they serve.